It's an unfortunate reality that anything that goes on our feet, especially in the summer when it's particularly warm, may end up developing an odor. Even though flip flops don't have much material to them, they can still develop an undesirable smell. There are many proven methods for removing odors from flip flops that can leave them smelling fresh, clean and a whole lot less embarrassing. All it takes is very little time and effort. Place a scented dryer sheet in each of the flip flops overnight. By morning they will smell fresh. Sprinkle baking soda in each of the flip flops and allow it to sit overnight. Wipe the baking soda off the next morning with a clean cloth and the odor will be gone. Place the flip flops in an airtight bag with crushed charcoal or kitty litter and leave it for 24 hours. Wipe them off with a clean dry cloth and the smell will be gone. Wash the flip flops with Oxy Clean or bleach. Read the manufacturer's instructions carefully. Some materials cannot be washed in the washing machine and bleach will fade colors. Allow the flip flops to air dry. Sprinkle salt all over the soles of the flip flops and allow them to sit for several hours before shaking the salt off. Make sure the flip flops are dry before applying the salt. 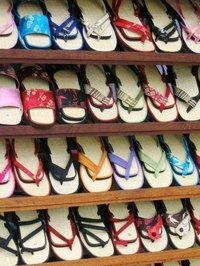 Alternating between two or more pairs of flip flops will help to reduce the sweat and odor in each pair. Sprinkle the flip flops with talcum powder after each use to help prevent odors.